Investdex is a new global investment portal helping investors connect with the very best products in the financial market. Advertisers are able to showcase the very best of their investments on a self managed and flexible listings index. 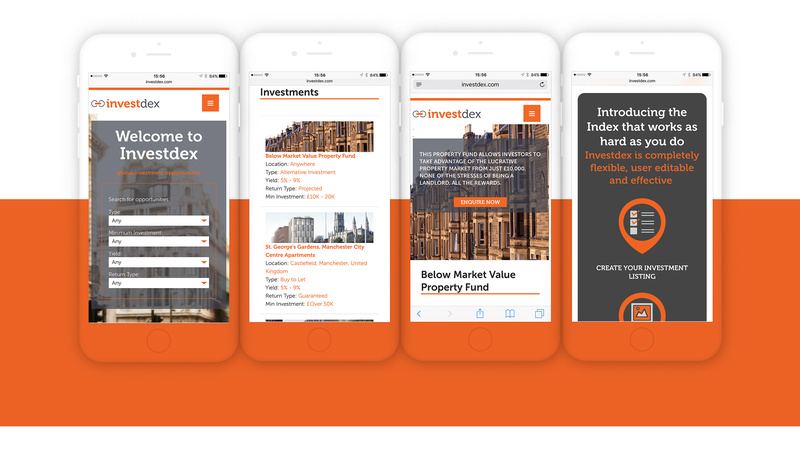 The concept of a investment portal has been fairly regularly trod, but this was a portal with a difference in that advertiser. We were asked to design and build the website which incorporates a function rich self branded advertiser login area where advertisers are able to sign up for advertising subscriptions based on a monthly contract and dependant on the amount of investments the client posts. Advertiser has control over what is advertised (once approved by Investdex) so client is able to self manage and target the investments with a good deal of flexibility. This is first stage of a multi-stage build. Investdex asked Swarm to come up with a branding idea that truly encompassed the innovative nature of the business model with the solid foundation built on many years in the financial market. The initial logo motif came from the idea of a ‘chain’ linking together client and broker with the central ‘link’ being Investdex this ‘link’ is wider to convey strength and stability and is also coloured in the orange which denotes the innovation of the company offering. This strength and innovation also comes through on the ‘invest’ part of the name, we decided that Museo would be the font family of choice as it has an innovative approach to the standard financial sector serif type font.